Our practice provides an array of endoscopic services in our state of the art facility in Fuquay-Varina. Our endoscopy team is made up of individuals who are dedicated to providing safe and efficient service from beginning to end. Dr. Vernon has been a leading endoscopist for over 20 years. His training has made him qualified to treat colon, liver, digestive, and rectal conditions. These conditions include cancer screenings, abdominal pain, ulcers, IBS, heartburn, acid reflux and beyond. Over the years, we have often seen the traditional colonoscopy as widely accepted for screening, surveillance, and diagnosis of lower GI diseases. The endoscopy technology has not changed significantly in the past few decades and interval cancers still occur. What we call “traditional forward viewing (TFV)” endoscopes provide no more than a 170° field of view. 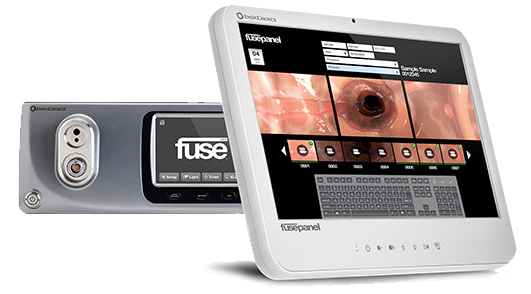 Now, Fuse Full Spectrum Endoscopy provides a 330° field of view, allowing the endoscopist to see nearly twice as much anatomy as traditional endoscopes. The GI Guy, Kurt Vernon, MD, is one of the regions leaders in advanced endoscopy. By utilizing Fuse Full Spectrum Endoscopy, he is able to provide a higher adenoma detection rate – 71% higher. Conversely, when the patient receieves a colonscopy with Fuse first, followed by traditional forward viewing (TFV), researchers found a lower miss rate of only 8%. By raising the detection rate, thus lowering the miss rate, we are now able to provide a much more accurate reading for our patients. This helps to save more lives and prevent more GI related diseases. Anesthesia Care Services PA, a clinical division of Medical Consulting Solutions, and a fully complaint AAAHC entity, provide the anesthesia services for Dr.Kurt Vernon. Highly qualified and credential Certified Registered Nurse Anesthetists (CRNA) relieve any anxiety and discomfort during the procedure. Though a variety of sedation techniques that allows one to have a pleasant, comfortable sleep during the procedure. One can expect to awaken at the end of your procedure in the recovery area with little or no discomfort. Most patients are able to leave within 30 minutes after procedure completion.